When customers are looking for a company that offers not just a great product, but also plenty of experience to back that product up, they typically look to a company like Little Wonder. Despite the company’s modest name, Little Wonder offers a significant amount of industry experience with more than five decades of equipment manufacturing for today’s homeowners. Its Little Wonder Edger is one of the most popular models on the market, largely because it offers the kind of power and precision that is highly in demand by today’s consumers when maintaining their lawn. 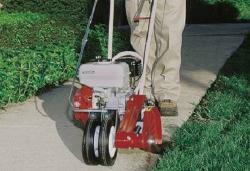 Among the company’s two most popular products are the Edger 6033 and the Edger 6232. Each model offers unique equipment and benefits that will be of great use to homeowners, with both entry-level power and high-end capacity easy to obtain. Before purchasing either of these popular models, consumers should be sure to know what unites them and what their primary differences are. For those consumers new to edgers, and those who need only a smaller model to work along driveways and sidewalks, the Little Wonder 6033 is a common choice. The equipment comes with a Briggs & Stratton Intek 550 engine that, while quite small, does not suffer in terms of performance. The engine is rated at 127cc of displacement, making it among the best engines paired with any edger currently on the market. The 6033 model comes with a 2.25-quart fuel tank, allowing it to perform most smaller edging jobs without requiring refueling in the middle of the task. Its 65-pound weight is actually rather light for equipment in this category, and most homeowners will find that it’s as easy to tote around the lawn as it is to actually use alongside the lawn’s edges. A locked cast iron cutter head and dual drive belts enhance the equipment’s durability in a wide variety of landscaping situations. There are few differences between the entry-level 6033 and the slightly upgraded Little Wonder Edger 6232 model, but the differences that do exist will be notable for homeowners. First and foremost, the 6232 uses a completely different engine that offers better performance with less displacement. The equipment trades in its Briggs & Stratton Intek for a Honda GX120, one of the most popular and durable power equipment engines currently on the market. The 6232 pairs its new engine with a slightly larger fuel tank, capable of holding 3 quarts of fuel for longer periods of continuous use during the summer months. The equipment comes with the same dual drive belts and the same locked cast iron cutter head. Like the entry-level model, the machine offers a cutting depth of up to 4 inches during typical edging jobs around the home. While there are some key differences between the two edgers, especially in terms of the engine that they use to get the job done, both pieces of equipment have several key things in common. Both the 6033 and 6232 enjoy a forward speed of up to 90 feet per minute, and both offer the largest cast iron cutter head currently available from any edger made by any power equipment manufacturer. The Little Wonder Edger also comes with two extension kits that work regardless of model. The first is called the Crack Cleaner Kit, and it’s designed to clean out the cracks and expansion fractures that typically occur on sidewalks after a few years of exposure to the elements. A Handle Extension Kit extends the handle upward, making the edger a great deal easier for taller individuals to use on a regular basis. Both kits are available from Little Wonder retailers, and they can each be installed in a matter of moments. Additionally, both the extension handle and the crack cleaner are easy to remove when they’re simply not needed. Of course, both of the company’s edger models are served quite well by a nationwide network of authorized retailers that both sell the original equipment and supply OEM replacement parts that are manufactured by Little Wonder in its own factories. This commitment to support should be standard with all edgers, and homeowners will likely be delighted by how easy it is to get the parts and service they need after their initial purchase. For decades, Shank’s Lawn Equipment has been working with Little Wonder to sell the company’s unique edgers to a growing consumer market. Alongside regular sales of new equipment, the company maintains an extensive selection of OEM replacement parts that can be used for maintenance or emergency repairs. Consumers will find everything they need at Shank’s in order to maintain their lawn perfectly throughout the summer months and into autumn. If you are in the Washington County, MD or Berkeley County, WV area, stop by Shank’s Lawn Equipment. This entry was posted in Uncategorized and tagged Edger, Little Wonder, OEM Parts, Shanks Lawn Equipment. Bookmark the permalink.